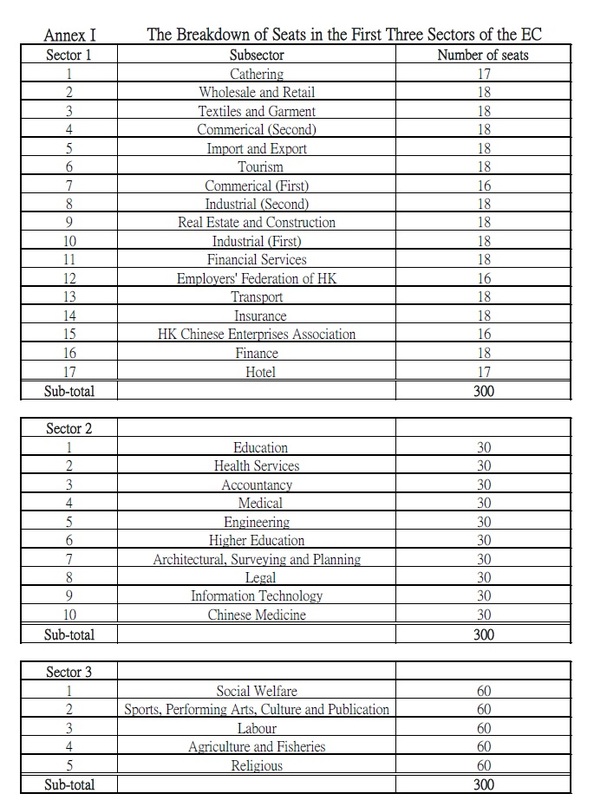 Since its launch in April 2013, Hong Kong 2020 has undertaken widespread and intensive consultations with groups and individuals including senior government officials, major political parties, members of LegCo functional constituencies (FCs), representatives of chambers of commerce, the diplomatic corps and academia, as well as more informal business and professional groupings. We have monitored closely the proposals for constitutional reform put forward by other groups and individuals, as well as views and commentary expressed in the press and in the broadcast and on-line media. We have commented extensively on current events related to our work and used social media and our website to engage with young people, including posting daily news clips on political reform and providing answers to frequently asked questions on constitutional issues. Building on what we have learned and on our own principles and careful internal deliberations, we published our initial Position Paper in November 2013 and, in conjunction with the Civic Party, an Alternative Consultation Document on 6 January 2014 entitled: “Finding the Right Path to Universal Suffrage”. At present there are 70 members of LegCo, of whom half are directly elected by some 3.4 million voters in geographical constituencies (GCs) and half elected mainly by small groups of voters in functional constituencies (FCs) which are supposed to represent business, professional and other vested interests. Discounting the five so-called ‘super seats’ in the District Council (Second) FC, the total number of FC voters in 2013 was only some 238,000, of which roughly 7% are companies (corporate voters) rather than individuals. Thus although there is a 50:50 ratio between the number of GC and FC LegCo seats, there is a huge difference between the overall size of FC electorates and that of the GCs. Moreover, under the split voting system, bills and motions sponsored by LegCo members must be approved by a simple majority of votes in each group. As a result, FC LegCo members can and do persistently block the passage of bills and motions supported by the majority of GC LegCo members who have a far larger political mandate. The long term retention of FCs, which enables the votes of these privileged sectors of the community to carry more weight than the votes of the general electorate, is not compatible with either the Basic Law, or internationally accepted definitions of universal suffrage. Changes to the composition of LegCo in 2016 are essential, to pave the way for achievement of full universal suffrage in 2020. Standing still in 2016 is not an option. the ‘split voting’ system should be abolished so that FC LegCo members, elected by small groups of vested interests, cannot block the passage of bills and motions supported by the majority of directly elected GC LegCo members. Article 45 of the Basic Law states that the NC should be ‘broadly representative’. It has been suggested that the size and composition of the future NC should be modelled on the current CE Election Committee (EC). However, there is a wide consensus in the community – which we share – that the electorate base of the current EC must be very substantially expanded before it can be deemed, in any sense, to be broadly representative. The electoral base of the EC is equivalent to only 7% of the general electorate and thus excludes some 93% of registered voters from playing any role in the CE nomination process. Further, the number of seats allocated to some sub-sectors enables the sections of the population they represent to exercise a disproportionate influence on the outcome of voting. To address these shortcomings we have explored a wide range of options for adjusting the number of seats allocated to sub-sectors in the First, Second and Third Sectors of the EC. These are shown at Annex I. It is clear to us that, in principle, the number of seats allocated to each sub-sector should be broadly proportional to the size of that sub-sector’s electorate. This is the only way to ensure the elimination of inherent anomalies, such as the fact that the Agriculture and Fisheries sub-sector with only 158 corporate voters qualified for 60 seats in the 2012 EC, while the Education sub-sector with 82,849 individual voters qualified for only 30 seats. Unfortunately, despite our best efforts, we have been unable to come up with an alternative formula for re-allocating seats that we consider meets the necessary standards of fairness, transparency and simplicity. The fundamental problem is that the EC has been designed on the basis of expediency, to ensure a certain voting outcome. The structure, composition and relative size of the sub-sector electorates in the First, Second and Third Sectors are so completely illogical that nothing, short of a complete overhaul, can remedy the imbalances in representation. The changes we propose to the size and composition of the future NC are intended to enhance its overall representation and, in particular, the participation of those not represented in the first three sectors. Without a redistribution of seats amongst the various sub-sectors these changes are not ideal but, in the interests of seeking to build consensus, we are prepared to commend them to Hong Kong people as a basis for the structure and operating procedures of the NC. the composition of the Fourth Sector be amended to include representatives of all other registered voters who are not entitled to elect representatives in the First, Second or Third Sectors. most importantly, all Hong Kong citizens should have an equal opportunity to participate in the process of electing members of the NC; this is the only way of ensuring that the Committee is genuinely broadly representative and not dominated by the interests of relatively small sectors of the population. 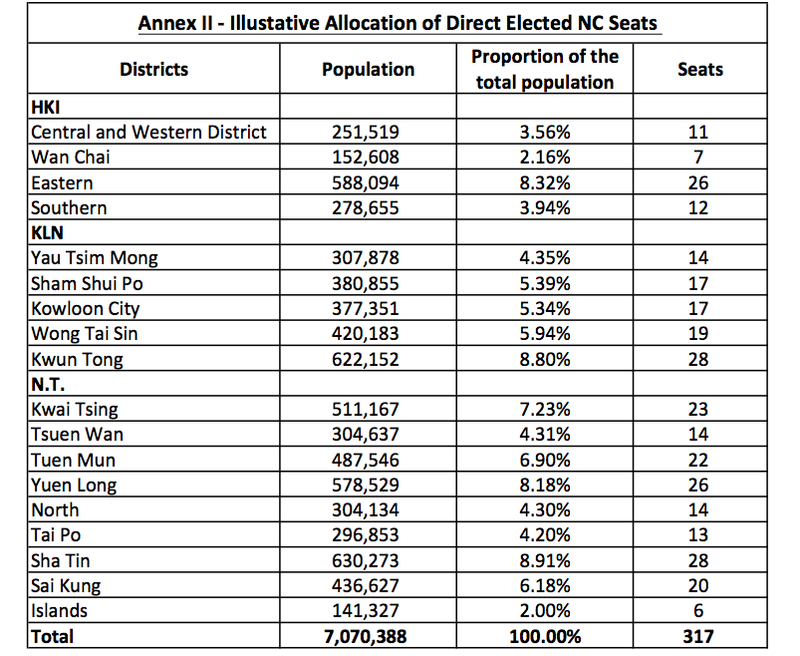 In practice, we propose that open elections be held in each of the eighteen District Council districts for the specific purpose of selecting Fourth Sector NC members and that the number of NC seats elected by each district be determined in proportion to the size of that district’s population. One possible formula is illustrated at Annex II. Despite repeated requests, the Government has failed to clarify what is meant by the concept of ‘organisational’ or ‘collective’ nomination which is referred to in its Consultation Document, but has no basis in the Basic Law. In the absence of clarification, and in the light of recent comments by leading pro-establishment figures, we can only conclude that what is envisaged is something similar to the current system used for electing ’en bloc’ Hong Kong deputies to the NPC. Such a system is objectionable, in principle, because it can be manipulated by any group of nominators that control 50% or more of the votes in the NC. In such a situation, potential candidates who are not supported by the dominant group stand no chance of being nominated. In practice, this system of voting has resulted in not a single democratically affiliated candidate being elected to the NPC in any of the four rounds of election held since the return of sovereignty in 1997; this is despite the fact that 55%-61% of the general electorate has consistently voted for democratic candidates in LegCo elections during the same period. In short, such a system cannot be supported. It does not conform to the Basic Law requirement that the NC nominate candidates in accordance with democratic procedures and, in all likelihood, will lead to the exclusion of potentially worthy candidates purely because of their political affiliation. It is essential that voters in the 2017 CE election have a genuine choice of candidates, not a list that has been pre-selected on the basis of political correctness. the current prohibition, in local legislation, on the incoming CE having any political party affiliation should be abolished; this will strengthen the role of political parties and promote greater cohesion between the workings of the executive and the legislature. Hong Kong 2020 is conscious that the proposals we are putting forward are not ideal. They are the product of many hours of careful deliberation and are put forward in a sincere effort to bridge the current divide in public opinion. We all wish to see substantive progress made to reform the methods of forming LegCo in 2016, as well as a system of universal suffrage for the election of the CE in 2017 that is credible in the eyes both of Hong Kong people and the international community. It is on this basis that we commend these proposals to Hong Kong people for careful consideration and support. This entry was posted in Activites, HongKong2020, Press Release and tagged basic law, CE election, election, legco, Legislative Council Election, press release, proposal. Bookmark the permalink.